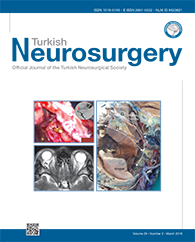 8Recep Tayyip Erdogan University, Department of Orthopaedic Surgery, Rize, Turkey DOI : 10.5137/1019-5149.JTN.21829-17.3 AIM: To determine the effects of resveratrol on inflammation and apoptosis after experimental spinal cord injury (SCI). MATERIAL and METHODS: Eighteen Sprague-Dawley rats were randomly divided into three groups. All groups underwent thoracic laminectomy. The first group received no other intervention. The second and third groups suffered SCI via the aneurysm clip compression method, and additionally the third group received resveratrol. After euthanizing the rats, immunohistochemical analysis and biochemical parameters of tumor necrosis factor alpha (TNF-?) and interleukin (IL)-1? were measured. RESULTS: The resveratrol group had statistically significant lower levels of TNF-?, IL -1?, and terminal deoxynucleotidyl transferasemediated dUTP nick-end labeling (TUNEL) positive cells and higher number of glial and motor neuron cells.